Robh Ruppel is a visual development artist and art director for Disney Feature Animation, and has worked on movies like Mulan, The Emporer’s New Groove, Treasure Planet, Atlantis, Tarzan, and Brother Bear, for which he was Art Director. He has also done gaming art and worked on gaming worlds like Ravenloft and Planescape for TSR . His latest project for Disney is Meet the The Robinsons. Ruppel also has a sideline interest in retro-60’s-modern style poster and cartoon art associated with pulp stye detective stories and film noir detectives, for which he has a site called BroadviewGraphics. This usually involves a lot of “good girl” art and fun pastiches of paperback covers and film posters. On his regular site you will find professional and personal work, including a variety of movie concept art in color and monochromatic renderings, character designs, backgrounds, monsters and fantasy and horror illustrations as well as traditional landscapes. His regular site doesn’t appear to be updated as often as his newer Broadview site and blog. I find the blog the most interesting because of its focus on digital painting from life, (If someone has a better term for this, let me know.) i.e. painting from life using digital painting tools like Photoshop and Painter, usually on a laptop computer. Digital painting is usually associated with concept and production art for films and games, and editorial illustration, where the speed with which color images can be painted is a distinct advantage. 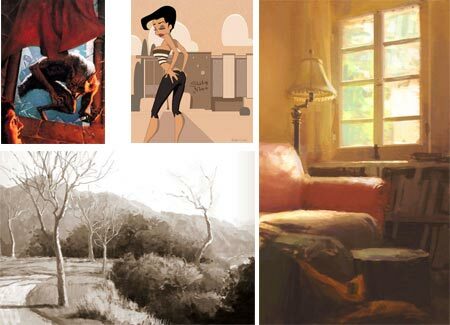 A number of artists, usually from that background professionally, have taken to using the digital tools to sketch and paint from life and often post their paintings on blogs. (See my post on Sparth, for example.) Digital painting not only lets you work quickly, but eliminates the need to carry around and set up paints and and other liquids, and allows you to paint in low-light level conditions that would be difficult with traditional media. Ruppel has been doing this for a while now, and not only does good digital paintings from life and posts them to his Broadview Blog, but often talks about the process and techniques involved. He also does something most painters can benefit from but don’t often do when they get out of school – value studies. Making monochromatic paintings is a great way to separate the understanding and appreciation of value from the distractions of color, and work with them independently. Ruppel teaches classes at Art Center College of Design and Entertainment Art Academy, and apparently takes his students out for digital (and/or traditional) painting excursions. His work is included in the book Drawing and Painting Fantasy Landscapes and Cityscapes by Rob Alexander and a number of gaming publications from TSR. Note: links contain some NSFW material. I came across your page while looking for some Tadahiro Uesugi images. I just had to say that I just skimmed over the other catagories on here,(I’m at work right now and will save the rest for later tonight) and I can already tell that it’s pretty thourough and full of all the things I have to spend hours looking for by myself. One stop shopping! Love it. keep up the good work. I consider digital painting the first true innovation after 600 years of oil painting, a breakthrough that combines all the techniques in one medium. I like the work of Robh Ruppel because it shows that digital techniques can be used also for “highbrow” art. Still most of what I have seen on the web is reproducing traditional graphics and themes, do you think there are already artists that can use the new medium to develop a new language, like Van Eick or Durer did?